Smoke this in your pipe! This is a follow up to the most recent BLOG where I talked about the Indian Tobacco plant that was used widely by many Native American tribes throughout the North Coast. Here is a photo of two smoking pipes that were used by local Native Americans that harvested hops and pears in the local Sanel Valley during the 1920s to 1940s. It was my understanding that these smoking pipes were left behind in the temporary harvest camps ... and that the one with the soapstone tip was from the Hupa tribe harvesters and the solid wood one was from the Pomo tribe harvesters, but I have no way to validate that. I have seen similar smoke pipes at the Phoebe Hearst Museum Museum of Anthropology. 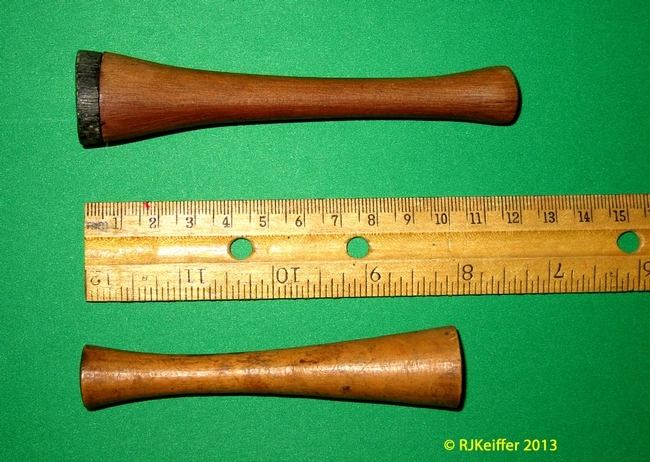 With this style of pipe, where the hole is drilled completely through the stem to a cup on the end, smoking would have to take place while lying on one's back or tipping one's head way back to insure that the "tobacco" did not drop out of the cup.